All members of the veterinary profession, including student vets and veterinary nurses, are invited to nominate a member of staff they feel is deserving of recognition. 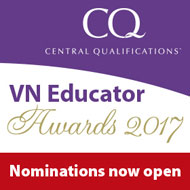 Central Qualifications (CQ) has launched the ‘Veterinary Nursing Educator of the Year Awards’ to recognise the hard work and dedication of staff that support veterinary nursing students. The awards are open to anyone involved in training and educating veterinary nurses in the UK - from college tutors and practical teachers to clinical coaches and other members of the training practice teams. CQ believes the time and dedication given to trainee veterinary nurses is vital - both for the success of the students and the future of the profession. The awards will be presented at the CQ Graduation and Awards Ceremony this year, which is being held at Central Hall in Westminster on 10 June. The prestigious event will celebrate the success of both students and staff together. The closing date for nominations is Tuesday, 18 April 2017.